In May 2012 Kirstie Clements was unceremoniously sacked after thirteen years in the editor’s chair at Vogue Australia. Here she tells the story behind the headlines, and takes us behind the scenes of a fast changing industry. It was then that I began to understand the level of perfectionism expected at Vogue. It was extraordinary. Corners were never, and I mean never, to be cut. Clements explains in the first pages about how she quickly left the reception desk, which is the position she started off with. She showed enthusiasm and initiative from the outset and this paid off when she secured a position in the promotions department after only 6 months at the magazine. She then goes on to explain the various phases of the magazine with certain hirings and firings. I was fascinated by her opinion on the whole magazine. I think witty copy on a fashion page is a must. I think it is most interesting that a project was launched by Vogue internationally called Health Initiative instigated by US Vogue editor Anna Wintour that bans models under sixteen from being used and also bans models who are suffering from eating disorders from being hired. Clements states that the second part is hard to monitor. One of my favourite chapters would have to be Chapter 10 as it discusses how Clements successfully secured a photo shoot and story with Crown Princess Mary of Denmark. With an idea, a Vogue business card, and a lot of perseverance, my team and I had turned a dream into a reality. I bought the December 2004 of Vogue because of this particular article with Crown Princess Mary, and although I didn’t keep the magazine, I still have the whole Vogue feature, as I loved the story. It is full of the most beautiful pictures, particularly the ones with Crown Prince Frederik. However, Crown Princess Mary is rather stunning in all the beautiful clothes shown in this article. I do not want to give away any more of the book. 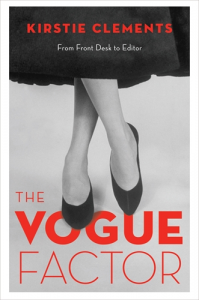 All I will say is that I loved this book and if you are interested in fashion, magazines and the Australian magazine scene then this is the book for you. This entry was posted in Australia, Reading and tagged books by Cathy Powell. Bookmark the permalink.